My categorization of the readings as poorly written allowed me to predict that I would spend more time deciphering the made-up language their authors used than I had time to spare. Categorization also “reduce(d) the complexity of the learning environment” by directing my activities toward “identify(ing) objects, topics, and tasks” that would be most useful to learning this week’s material. (Albee & Yoon, 8) I was then able to determine that I should skim the topic sentences of each paragraph, try to discern the main points of each section of each article, and rely mostly on the week’s summary presentation. I did, however, find “Categorization of Foods as Snack and Meal” a useful example of the ideas expressed in the other articles. Thus, I would not categorize it with the other two. Spalding, T. L., & Murphy, G. L. (1999). What is learned in knowledge-related categories? Evidence from typicality and feature frequency judgments. Memory & Cognition, 27(5), 856-867. Proficiency Project 1 began with an introduction. Here’s what I posted. I’m Joanna. I graduated in May with a BA in creative writing. I’ve also got the Library Technical Assistant associate degree from Ivy Tech. I’ve been working as a student clerk at Greenwood Public Library since 2012, after completing my practicum there for the LTA degree. I’m really excited about starting the master’s program. As far as personal interests go, I’m a HUGE Kdrama fan! Nice to meet you all. I’ll add on to this post as I complete the project. Discuss your preferred operating system including the version and why it’s your favorite. My preferred operating system is Windows XP, because I’m old, and I’ve used it the longest. I grudgingly upgraded to Windows 7, and I’m happy with that, because I could easily make it look like Windows XP. I don’t really remember how much tweaking I did to 7, but I don’t think I can say, anymore, how 7 is different from XP. I’ve become very familiar with them over the years. I know how to troubleshoot, set up network connections, and remove viruses manually. I haven’t used Windows 8 much, but I haven’t found it to be very user-friendly, at least on my kid’s laptop (which is the only place I’ve used it). 8 was obviously designed for mobile devices first, with PC navigation included as an afterthought. When I don’t know where to find something in 8, settings, for instance, or some functionality, (rather than just docs or programs) I don’t have the first clue as to where to begin to look. 8 just isn’t as intuitive as XP or 7. I haven’t used Apple devices much, either. But I’ve been able to find my way around iOS relatively easily. It seems very similar to Windows XP or 7, just with some name changes. I’ve used Ubuntu (Linux) less often than anything else, after my kid replaced Windows 8 with it on his laptop. It, too, seems to be very similar to Windows 7 and iOS. In fact, I’ll probably put it on my PC if I’m terribly unhappy with the Windows 10 upgrade. List three proprietary software programs and one open source software program you’ve used, list the Gile extensions associated with these packages, describe how you’ve used these pieces of software. If you don’t own any software, download both proprietary and open source software from IUware at http://xxxxxx.iu.edu/ to explore. Three proprietary software programs I’ve used would be MS Word (.doc/x), MS Excel (.xls/x), and MS Publisher (.pub). Word is word processing software that I use daily, not only when creating documents for the library, but also doing my transcription work, transcribing audio files in typed reports. I also use it for writing assignments for class. Excel is database software I use for organizing data, tracking science fiction series titles as they’re added to the collection. This allows us to be consistent with series labels that don’t appear in the catalog, as new titles are added to a series collection. Publisher is another piece of document creation software, similar to Word, but intended to create documents that include a lot of graphic images. I use Publisher to create signs, reading lists, and brochures. Open Office includes open-source versions of all of these MS products. I have used it in the past, when I did have access to licensed versions of Word, Excel, or Publisher. However, these three MS products could easily be lumped together as MS Office, and breaking them down to components kind of seems like cheating. So, here are some other proprietary products with their open-source equivalents that I have used. Photoshop (.psd) is notorious around the internet for image editing and meme creation. I have used the licensed version for editing images that I have posted to blogs and websites. Because licensing for Photoshop is so expensive, we do not have access to it at the library. And MS Publisher–or even Fireworks–can’t quite compare to Publisher’s ease of use. GIMP is an open-source competitor of Photoshop I’ve used and found to be much more intuitive as a Photoshop user, than any other alternative, except online tool Pixlr, which is free to use, but not open-source. Finally, Microsoft’s Internet Explorer is a proprietary web browser, used for accessing the internet. It’s very buggy, and has little respect for users’ privacy. Firefox, is an open-source browser. It’s kind of a resource hog, but less buggy, and is dedicated to preserving users’ privacy. List two web browsers you’ve used and discuss your preferred browser. See above discussion of proprietary software. However, not to skimp by combining two answers into one, I’ll add that Google Chrome is the worst of the three. Although it’s fast and slick-looking, its sole reason for existing is to scrape private information for marketing purposes. In fact, the software does not reside on the user’s computer, as the other two browsers do. Chrome can only be accessed through the cloud, and all of its users’ information resides on Google’s servers. This allows Google complete control over the users’ private data. I used it for a while, but found it needed to update nearly every time I opened it. This got frustrating after a while. And its heavy focus on absolute anonymity felt kind of creepy. So, for its balance of user privacy and ease of use, Firefox would have to be my favorite browser. List the electronic and digital storage devices you use. Describe why you use these. Really, I only store info on PCs, or wherever I’m actually using the files. If I use cloud storage at all, it’s through webmail. I try to avoid cloud storage for privacy reasons, although emailing files to myself basically amounts to cloud storage anyway, especially if the email account is Gmail. I don’t really use USB drives at all. I don’t have much reason to carry files around. If I need to transfer files from one place to another, and I don’t do it by email, I can log into my work computer from home or use Samsung link through my phone to access files on registered computers. Again, there’s a privacy issue with that, but I don’t do it often. Subscribe to the LIS department e-mail list at SOIC-LIS-INDY-L@iupui.edu. Describe a posting that you’ve read on this list. Ninety-nine percent of the messages that have come through the list are announcements of job openings. There have been a couple of promotional items, for example, promoting a team of librarians participating in the IUPUI Regatta or promoting the Indy Literary Pub Crawl to benefit Indy Reads. In a few sentences, discuss the pros and cons of synchronous versus asynchronous communication in a graduate course and in the “real world”. Asynchronous communication, in both a graduate course and in “the real world,” allows participants time to consider their responses. Asynchronous communication allows for more information to be communicated in a single message. It is often easier to include other forms of media in asynchronous communication. However, asynchronous communication takes more time, and is often more difficult to use for group collaboration. Synchronous communication is fast and is ideal for group collaboration. However, a conversation may be more difficult to follow, as in a group chat, many people may be writing at the same time. Compare the results of two different search engines for the topic of your choice. I searched “Kdrama” on four search engines, Google, Bing, Yahoo, and Duck-Duck-Go. I found that Google provided the most variety. All four search engines put an ad at the top of the search results. In each case, the ad was for the site that also appeared as the first result. That would be Dramafever, a website that provides free streaming Kdrama series with English subtitles. On Bing, six of the eight results on the first page were links to sites that provided streaming shows. On Yahoo, seven of ten unpaid sites were for places to watch kdrama. Yahoo also had the most ads, but provided the most alternative suggestions for search terms. Seven of the first ten results on Duck-Duck-Go were also places to watch. However, this search engine placed a wikipedia entry across the top of the page, and made suggestions of relevant search terms to the right of this banner. Another interesting feature of Duck-Duck-Go was that the results page continuously scrolled, with more results being added at the bottom. This made me wonder what that did to page ranking. It’s said that people don’t usually go beyond the first page. I wonder if people look at more results this way, if there is no second page to go to. Google offered nine unpaid results, and only four of those were places to watch. What was most interesting to me was that the subReddit r/Kdrama was the third result. Several blogs, subject-specific wikis and a link to the Tumblr hashtag #Kdrama were also included. I found Google to provide the widest variety of information for my basic search term. 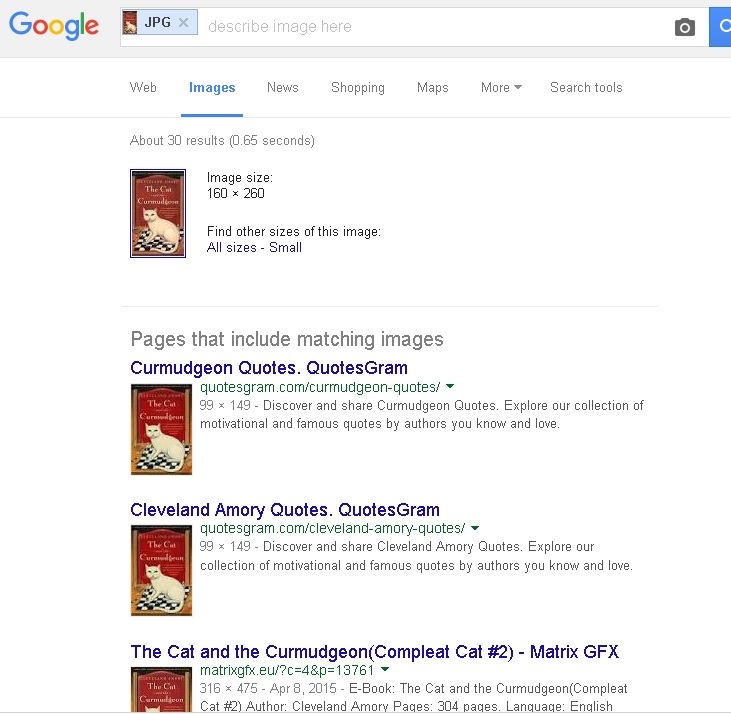 Search Google by dragging an image in the Google Image Search Box at http:// images.google.com. Provide the image and the search results. Also, be sure to provide a screen capture of your results. Discuss a situation when this option might be useful. 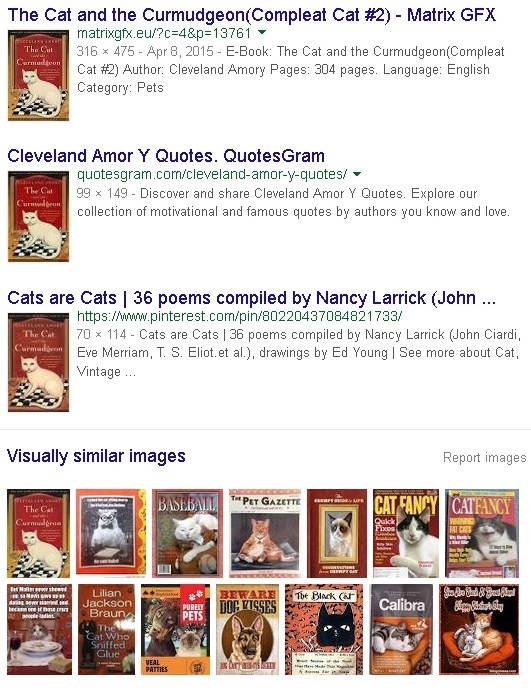 Google image search is eminently useful for answering the perennial reader’s advisory question, “What’s that book with the red cover and the white cat on it?” I have often used Google image search to figure out what book a patron is looking for when all they can tell me about it is what the cover might have looked like. would not be easily found or searched using a Google search. Be specific. located by searching “Korean Drama” via the Inspire search bar. This article would not be crawled by a search engine such as Google, because it was published in a scholarly journal, requiring a subscription, in this case paid by the state, for access. Articles such as these are important for use in research. Evaluate a website using specific web evaluation criteria. Provide a list of the criteria you used and your evaluation. When evaluating an internet resource, the following list of criteria is helpful for recognizing a credible source. For the purposes of this assignment, I evaluated the following site: http://homelessadvice.com/index.html. Although it is tempting to give the author the benefit of the doubt, I would not say this website is very credible. There is no “about” page establishing the author’s identity and credentials, only a vague assertion on the front page that the author was at one time homeless. His initials appear on the donation page, attached to a quote asserting his belief that specific organizations are worthy recipients of donations. The accuracy of his information is subjective, based solely on his own personal experience. As a result, it can’t help but be biased, even though he does, at times, address both sides of various issues. The copyright statement is dated 2013, but there are no publication dates associated with any of the articles. One of them mentions that the author became homeless in 2011. These dates are recent enough to be considered current. And the author does go into great depth and detail regarding his subject. So it might be worthwhile to grant the author some credibility, bearing in mind that his authority and accuracy cannot be proven. Provide a shortened URL for a page within the website you evaluated using one of the popular URL shorteners. Describe a formal research or inquiry process you’ve used in the past. Did it work well? Why or why not? Create an annotated list of the steps you think are important in conducting an information inquiry. I generally apply the inquiry skills discussed in the class materials. I begin with a reference interview, referred to as “questioning” in the materials, helping the patron refine her question, and tailoring the search terms appropriately. We would then explore the relevant resources, evaluating for credibility and relevance to the topic. The process of assimilation comes next, as located information is pieced together with existing knowledge, prioritized and interpreted. This synthesis leads to inference, in answer to a question or in support or disagreement with a thesis. Reflection on the process provides insight and inspiration for refinement of subsequent inquiries. Often, this process is not as successful as I would like. Patrons aren’t generally patient enough to tolerate such an involved process. Sometimes just trying to refine their question seems to communicate a lack of experience, understanding, or usefulness. If they wait out the process, they usually find it useful. But many times the patron is happier if I try to refine their question, let them go off to search on their own, but then return to them with results I’ve continued to search for after they’ve stepped away from the process. Select a topic or question to explore related to library or information science to investigate for the rest of the (D. Inquiry Skills) items. Do a web search for your topic. List two websites related to your topic. The first would be http://homelessadvice.com/index.html as discussed above. Another is http://ilovelibraries.org/article/who-are-homeless-people-my-library an article on a website affiliated with the ALA. Compare and contrast the results you find using IUCAT at http://www.iucat.iu.edu/ with another OPAC found at WorldCat at http://www.worldcat.org/. Provide an example. Use at least one screen capture in your discussion. I found it a little disheartening that there were only four results, and that three of those were quite old. One, the most recent, was local, while one other wasn’t, at first, apparently, related to the topic. I didn’t feel that I could refine the query any further, as the terms used were pretty basic. IUCAT limits results to items in the library system’s collection, which is to be expected. Locate a MARC record in an OPAC. Include a screen capture of the record. Discuss at least five of the fields in a MARC record. In the screen-capture below of the MARC record below, we see the following fields: the 010 tag denotes the Library of Congress Control Number, 2009045798, here. The 020 tag denotes the ISBN number. There are two entries for this tag on this record, 9780838910504 and 0838910505. The 100 tag denotes the personal name main entry, otherwise known as the author, and in this case Holt, Leslie Edmonds. The 245 tag denotes the title information and includes a “statement of responsibility” (again, the author) Public library services for the poor : bdoing all we can / c Leslie Edmonds Holt and Glen E. Holt, in this case. While the 250 tag denotes the edition, as there is no 250 tag on this record, one can assume there is only one edition of this title. 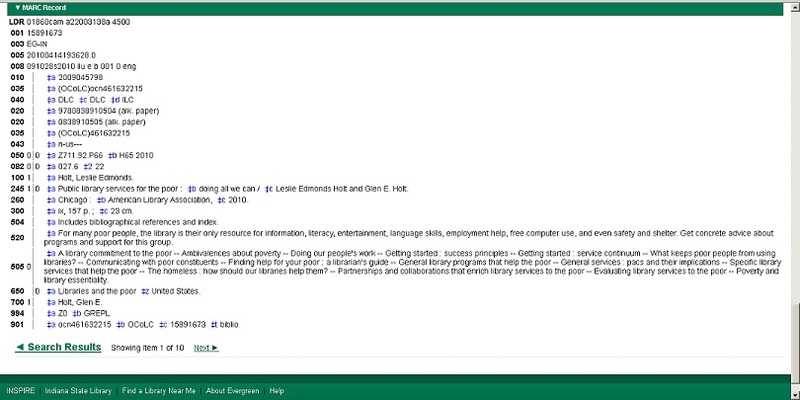 Find a subject heading related to your topic in the Library of Congress Subject Headings. In addition to the heading, provide BT, RT, and NT terms. Discuss the value of controlled vocabulary through your example. The authorized subject heading for my topic is “libraries and the homeless.” A related term would be “libraries and the homeless–case studies.” A broader term would be simply “libraries.” There is no narrower term provided by LOC, but one might be “libraries and poor children,” though poor children may not necessarily be homeless. Perhaps it’s more of a related term. The use of controlled language can be helpful when the controlled language in use is known. For those searching on their own with no prior knowledge of the controlled vocabulary in use, it can make searching more difficult. Provide the LOC and DCC classification number for a book that might be found on your topic. Conduct a search for your topic using a subscription database found at IUPUI at http://www.ulib.iupui.edu/resources/abc/A. Provide a complete citation for the database. Provide examples of how truncation, a proximity operator and Boolean logic could be used in your search with this particular database and your topic. The given link was broken, so I did my best to find the appropriate resource. Using the LOC subject heading “libraries and the homeless” brought up plenty of relevant results. I don’t think using truncation, a proximity operator, or Boolean logic would improve the results. 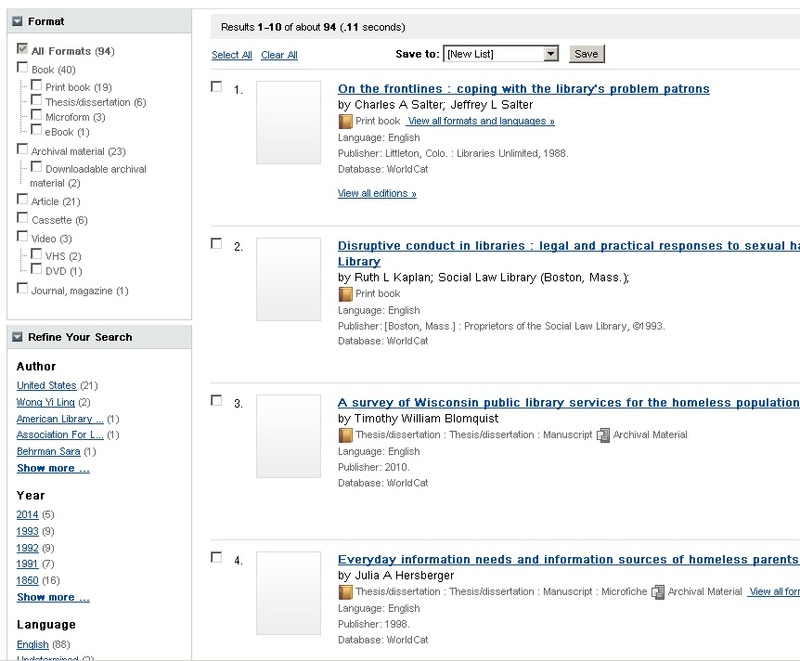 However, using truncation to search “librar*” rather than “libraries” would yield more results, returning both “library” and “libraries.” A proximity operator would also return more results, returning all results where “libraries” was within so many words of “homeless.” Libraries AND the homeless, however, returned the most relevant results. Compare and contrast your findings using an OPAC, a restricted-access database, and open web results. Discuss the reasons why each might be useful in particular situations. Provide at least three examples. The results found in the OPAC would be most useful if a patron was looking for a physical book that was currently on the shelf. This, however, returned the fewest results. The restricted-access database returns the most credible, scholarly results, but requires access to a subscription service. These would be most useful for a general reference query. Open web results return the least credible results, and far more of them than are practical to use. Use Citation Linker at http://www.ulib.iupui.edu/citation-linker to locate one of the key library journals. Search this journal for your topic. Describe what you found. 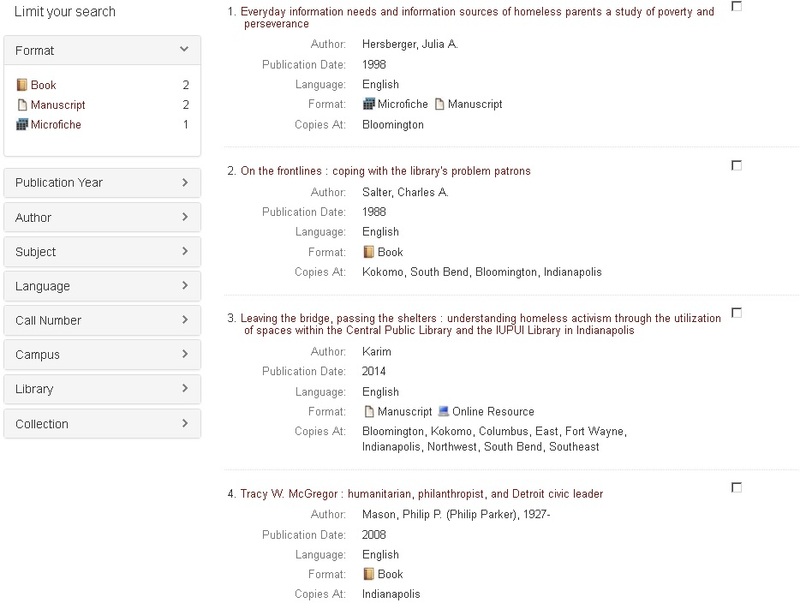 After using the citation linker to locate Library Journal, I searched for “libraries and the homeless.” I found, as I would expect to find, relevant scholarly articles about the subject. Create a book, article, and website citation using two different citation styles (a total of 6 citations). Be sure to name or label the styles used. Use one of the online citation generators to create at least one of your citations. Holt, L.E. Holt, G.E. (2010). Public library services for the poor: Doing all we can. Chicago: American Library Association. Holt, Leslie. Public Library Services for the Poor. Chicago: American Library Association, 2010. Print. Kelleher, A. (2013). Not just a place to sleep: Homeless perspectives on libraries in central Michigan. Library Review, 62(1-2), 19-33. Kelleher, A. “Not Just a Place to Sleep: Homeless Perspectives on Libraries in Central Michigan.” Library Review. 62 (2013): 19-33. Print. “Extending Our Reach: Reducing Homelessness Through Library Engagement.” Extending Our Reach: Reducing Homelessness Through Library Engagement. American Library Association Office for Literacy and Outreach Services, 2012. Web. 20 Oct. 2015. <http://www.ala.org/offices/extending-our-reach-reducing-homelessness-through-library-engagement>. In a few sentences, describe your experience using a resource discovery tool such as Sherloc at the Indianpolis Public Library. I found Sherloc to be pretty cumbersome and unhelpful. Doing a basic search for “homelessness in libraries” brought up promotional press releases for old (2011) library exhibits that had been publicized on the libraries web page, mixed in with books and other materials. Even an advanced search didn’t intuitively allow for multiple search terms–filling in multiple terms in the subject field, for instance. Once the search was completed, then you could sort out the irrelevant results with a “refine” drop-down menu. This seemed like an extra, unnecessary step. Why couldn’t I select criteria to sort those out at the point that I made my original search? I didn’t care for it at all.